Magerealm_New Mounts System now Arrives! Have you ever dreamed of riding pagasus in Magerealm? Now new mounts system arrives! In the first week of the system gets online, players will enjoy half price discounts. 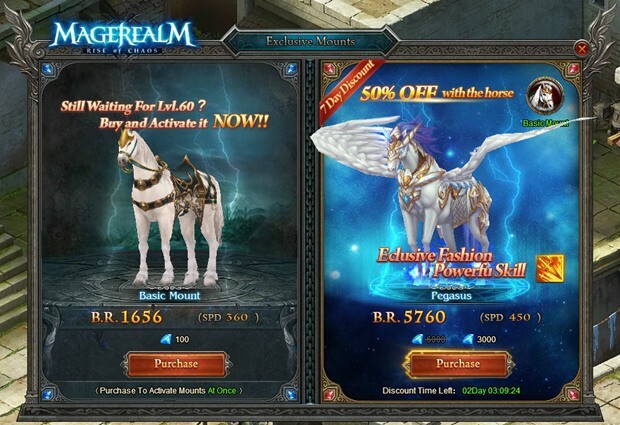 The mounts system will be available after lvl.60, or you can activate it by purchasing the basic mount(the horse) with 100 diamonds.Besides the horse and the pagasus, there will be more mounts joining Magerealm in the near future.